OUTBOUND: ROUTE #2 from Civic Center Station to East Lake Station Cont. : W. Peachtree St.
OUTBOUND: ROUTE #26 from Garnett Station to Bolton Rd. & Parrot Ave. Cont. : Peachtree Street, Right – Forsyth Street, Right – Trinity Street, Left – Peachtree Street, Left – Ivan Allen Jr., Right – Marietta Street, Regular Route. INBOUND: ROUTE #26 from Bolton Rd. & Parrot Ave. to Garnett Station - Continue Regular Route, Left – Ivan Allen Blvd., Right – Peachtree St., Continue to Brotherton St. (Behind Garnett Station) End of Line. INBOUND: ROUTE #42 from Lake Wood Station to Garnett Station Cont. : M.L.K. Jr Drive, Left – Peachtree Street, ContInue to Brotherton St.
Continue Hank Aaron Drive to Capitol Ave, Left – Memorial Drive, Right – Forsyth Street, Right – Trinity Ave., Right – Peachtree Street to Brotherton Street (Behind Garnett Station) End of line. OUTBOUND: ROUTE #813 from West Lake Station to Georgia State Station via Garnett Station Cont. : Peters St., Cont. 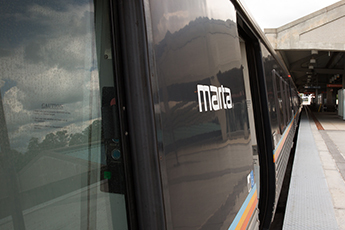 : - Trinity Ave., Right – Peachtree St. to Brotherton St., and Garnett Station (Alight and Board on street at Garnett Station), Continue Peachtree St., Left – Memorial Drive, Left – Capitol Ave., Continue onto Piedmont Ave (Service Georgia State Station).